I recently took a day trip to Calaveras Big Trees National park in California. The park is home to some of the remaining giant sequoias — the world’s largest trees. These trees are so amazing. When you’re underneath them, you feel the same calmness that you feel from a wise elder. The largest sequoia is 275 feet tall and 36.5 feet in diameter. The oldest tree lived for 3200 years. The most enlightening fact that I learned about the Big Trees was that they need exposure to fire at certain times in their life cycle in order to thrive. Before humans arrived, fires were started, mostly by lightning; those fires might burn uninterrupted for months at a time. The first people to arrive in this area, over 12,000 years ago, understood this cycle; they adapted to it. They realized that the fire improved their own food supply, gave them better materials, and opened travel routes. But modern humans build permanent houses; we obviously don’t want our houses destroyed. So we put out the fires the giant trees need to survive. These long-living trees aren’t harmed by the fire. The fire burns out the competition for water and sunlight. Without the fire, the forests become unhealthy and overcrowded. The forest rangers are now looking for ways to create small controlled fires. In this way, they can keep the trees alive and not destroy the nearby houses and other buildings. Fire has always been associated with the sun for obvious reasons. Since the ancient people viewed the sun as the perfect metaphor for God, because it gave light, warmth, and was unconditional, fire came to represent God or pure divine energy. Fire also symbolizes the energy of passion and desire. And it’s equated with emotions that flow outward such as anger, hatred, jealousy, and rage. Fire is yang and assertive in nature; it’s masculine energy. If our desires comes from our True Self, our fire is in balance; we offer our best to others and the world. On the other hand, if we’re passionate about achieving false desires and winning at the expense of others, our fire is burning out of control. Likewise, when beliefs fill our mind that restrict our true desires or passion, our fire can’t burn. We drown our fire with the water of emotion. If the giant sequoia does thrive and live a long life, they’re among others trees; but they stand alone, independent. Likewise, codependence, and the emotions that go with trying to please others, often restricts our own growth. Their weeds choke out our life force. Too often, people feel responsible for another’s emotions. The truth is that our emotions are the feminine reflection of our own masculine mind. When we join another in sympathy, we usually strengthen their beliefs and drown with them. We put out our fire trying to put out their fire. In truth, they just might need a long-burning fire to destroy their weeds. If we’re emotional or overly sensitive, it’s time to look very hard at our desires or trim back our beliefs. Sadly, some religions and philosophies prescribe just the opposite. They tell people to trim their desires and believe their beliefs. In this way, they pour water on our fire. The metaphor of the giant sequoia trees is ripe for level confusion. The typically physically-focused person would look at the sequoia’s need for fire and relate it to people. They’d say, “Yes, this is a message that when population is too big, we suffocate each other.” They’d take it as proof for the survival-of-the-fittest theory. They’d suggest getting rid of the little people so the big ones can thrive. They’d even condemn people for building permanent homes. Symbolism is harmful and ineffective when it is interpreted at the purely physical level. It causes people to see others as the problem. Then the problem can’t be solved. Symbolism unites only when we apply it to our minds. Symbols, just like emotions, always point inward. They show us what to let go, not where to go or what to do. For the trees to grow very old and very large, they need the support of fire. If their life force (fire energy) is strong, they’re not consumed by the fire, they’re nourished by it. Mythology often talks about disasters destroying people and places. But it also talks about the connected ones (who had the fire of God within) and knew what was coming. They either had the power to endure it or the foresight to move out of the way. When we don’t have pure inner fire, we can’t endure the outer fire. Our beliefs or weeds steal too much of our life force. Fire is assertive. When our fire is from the True Self, we’re a contribution to the earth. We give more than we take. Our unconditional True Self burns away the beliefs that keep people sick, suffering, or enslaved. The giant sequoia isn’t suffering or sacrificing as it grows; it is just doing what comes naturally. It’s inspired from within so nature removes what could harm it from without. Weeds (or beliefs) take far more than they give. They keep us from reaching our true potential. Beliefs block our true fire, our real power. Like the weeds, they take all the nutrients and give nothing back. When they arise, with their powerful flood of emotion, we must face them, not fear them. We must let them know that they are false, and they have no power. Each time we do that, we are purified by the fire of truth and wisdom. One day, we’re the tallest tree in the forest — not by force of will but by force of nature. 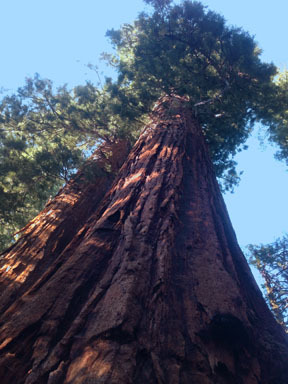 This entry was posted in Success and tagged beliefs, Calaveras Big Trees National park, desire, emotion, fire, giant sequoias, LETTING GO, passion, Success.